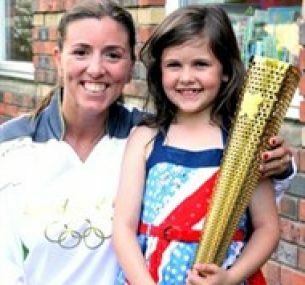 Louise (pink T-shirt) was nominated to be an Olympic Torchbearer by her friend Melanie because of her inspiring work in raising funds for Children with Cancer UK. With friends and family, otherwise known as Team Katie, Louise has raised over £30,000 for Children with Cancer UK. Team Katie has taken part in the Virgin London Marathon for three years. Why are we called Team Katie? “My beautiful daughter Katie was the reason my friends, family and I put ourselves through six months of long runs, aching limbs and sore feet. Katie was diagnosed with acute lymphoblastic leukaemia (ALL) in 2009 and has been undergoing intensive treatment for the last three years. It has been such a hard time for me and my husband Stewart as we’ve continued to work as well as provide care and support for Katie. We watched our little girl Katie go through chemotherapy, loss of hair and prolonged spells in hospital, but she is the bravest little girl I know and I am so proud to be her mum and see her courage. Katie is tackling leukaemia head on whilst starting big school and maintaining as normal a childhood as she can. She is an inspiration to me and all those who’ve had the pleasure of her company. Hopefully this is the last year of treatment and Katie will be able to live her life free from the burden of leukaemia and we can get back to being a normal family. We continue to keep our fingers and toes crossed that she will make a full recovery – the signs at the moment are looking good. By taking part in the Virgin London Marathon, all we had to do was run a mere 26 miles. Katie and all the other little children around the country have to go through excruciating pain, hair loss and long recovery process when diagnosed with cancer. Our job seems easy in comparison. Children with Cancer UK has been an enormous source of knowledge and support during the dark times. We wanted to give something back to this amazing charity. Without them, we simply wouldn’t have been able to cope. They have taken Katie to so many great places and taken the burden off of our shoulders at times when we simply needed a break. They have done things with Katie that have made her laugh and smile and feel like a normal healthy little girl and they continue to do this for so many other children. Some will not be as lucky as Katie, and will not get over leukaemia so when I say they have been our saviours I don’t use this term lightly. Our huge thanks and congratulations to Louise and her friends and family for their wonderful support.